Here’s today’s Quiz Question, so sit up straight and try to look as though you’re interested. Now then, what’s the capacity of a standard bottle of wine? And stop messing around with your mobile phone, because I know what you’re up to. Well, the answer of course is 75 centilitres. If you got the answer right, then accept my congratulations and take the rest of the day off. If for some inexplicable reason, you managed to get it wrong, I hope you feel suitably humiliated. The funny thing is that no one is really certain why this slightly odd number became the standard. It’s been suggested that 75cl is about the maximum that could be hand-blown with a single lung-full of air. Another explanation is that it’s a convenient weight for carrying. Yet another idea is that it’s about right for a meal for two people. But why two people? It’s probably more likely that the standard bottle size developed by a trial-and-error process. I’ve seen claims that ancient Roman bottles of 75cl have been unearthed and this might add a bit of weight to the glass-blowing theory because the litre didn’t appear until 1795. During the 19th century, technology developed to make bottles a standard size, although various wine-making regions opted for slightly different capacities. Even so, most 19th century wine bottles were made to hold between 50cl and 80cl. Surprisingly, it wasn’t until 1979 that the United States government decided that all standard wine bottles should be 75cl – almost exactly a fifth of a gallon. The European Union also standardised, with the result that the 75cl bottle became adopted world-wide. Wine bottles actually come in well over twenty different sizes, not including those awkward heavy glass casks that are used for cheap plonk. Apart from the 75cl bottle, the other most common sizes are the quarter-bottle, the half-bottle and the magnum. You’ll usually see the quarter-size bottles on aircraft. They’re usually 18.75cl and known as the split or piccolo. In Europe, half-bottles (37.5cl) are very common and most French châteaux offer their wines in this size. In Thailand you might see the occasional Rhône in half-bottles but that’s about it. Magnums are the equivalent of two 75cl bottles or 1.5 litres. Although the word “magnum” is also applied to guns, plums and a brand of ice-cream it evidently first appeared in 1788 in a prose work by the Scottish poet Robert Burns. There’s also a range of extra-large bottles but they are very rare and you could happily go through life and never encounter one. 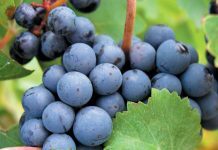 They’re usually limited to Bordeaux and Champagne and for reasons which are not entirely obvious, most of them have Biblical names like Methuselah, Salmanazar and Balthazar. You’ll never see these huge bottles around here except as display items in up-market wine bars and restaurants. One of the largest bottles is called the Nebuchadnezzar and holds 15 litres of wine, but it’s a massive thing and almost impossible to lift. There are even larger ones used for Champagne but pouring wine from these elephantine objects would surely be a hazardous operation and likely to create an unseemly mess. You’d be forgiven for assuming that Monastrell is a quaint Spanish village nestling in the hills, surrounded by olive groves and vineyards. It’s a lovely thought, but alas, not true. Monastrell is actually a grape, known in France as Mourvèdre and popular in the Southern Rhône and Provence. It tends to produce rather tannic wines which are high in alcohol with earthy aromas and soft red fruit flavours. 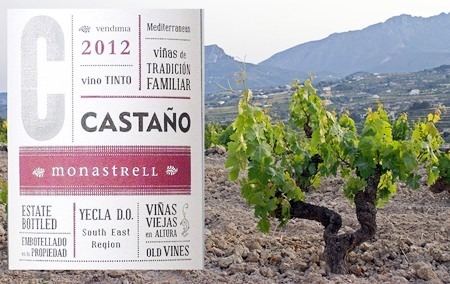 Castaño is a large winery in the old Spanish town of Yecla which lies about an hour’s drive inland from the bustling sea port of Alicante. The wine comes with a technical-looking no-nonsense label which I rather liked. Pour some of the wine and you’ll see thick syrupy legs, usually a sign of plentiful alcohol, in this case 13.5%. If you give the wine a hearty sniff you’d swear that it’s a larger-than-life Southern Rhône, but somehow more rural and earthy. The aroma is spicy and peppery with reminders of black cherries and plums. Then in the background, faint woodland smells appear but it’s the pepper that dominates – you can’t miss it. The wine is totally dry with pleasant flavours of black fruit and a satisfying layer of tannin, giving it a very firm structure and a sense of authority which probably has been inherited from the old vines (viñas veijas) that have produced the grapes. It has a bit of rustic machismo too. If this wine were a movie star, it would probably be Charles Bronson. I enjoy this kind of wine because I’m rather a tough and macho type myself. You can ask any of my friends down at the embroidery club. But perhaps you feel like something a little lighter. 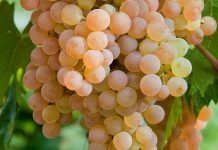 It hardly needs saying that Moscato is just another name for Muscat, one of the oldest grape varieties in existence. It’s grown in almost every wine-producing country in the world, as well as several countries that wouldn’t immediately spring to mind including Croatia, Azerbaijan, Moldova and Serbia. There are a couple of hundred Muscat varieties and they all tend to have a striking perfume-like fragrance. They’re also light-bodied, sweetish and low in alcohol. In recent years, they’ve become enormously popular. 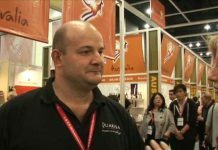 Opera Prima wines are made at the J. García Carrión winery in La Mancha, one of the most advanced wine-making facilities anywhere. And incidentally, you may recall that La Mancha was the setting for Miguel de Cervantes novel, Don Quixote. Today, La Mancha has eight hundred square miles of vineyards making it the largest wine-making region in the world. This sparkling rosé has a heady aroma of white flowers, fresh berries, lychee and raisins. On the palate, you’ll get the sensation of delicate bubbles as well as the taste of summer fruits. There’s a lively refreshing mouth-feel, a dash of acidity to balance the pleasant sweet flavour and a very good long finish. If you enjoy mildly sweet sparklers, give this a try. It’s a perfect summer wine and even at this time of year you can still enjoy it in torrential rain, assuming of course, that you are indoors.